I've complained in the past about how the Marvel Cinematic Universe tie-in comics sometimes just don't deliver much. They feel like placeholders, not able to really expand the universe and so the tactic is often to just explore from a different angle. So I wasn't expecting much when I picked up the first issue of the Guardians of the Galaxy tie-in series. The book really is a prequel or prologue or, well, prelude to Guardians of the Galaxy. 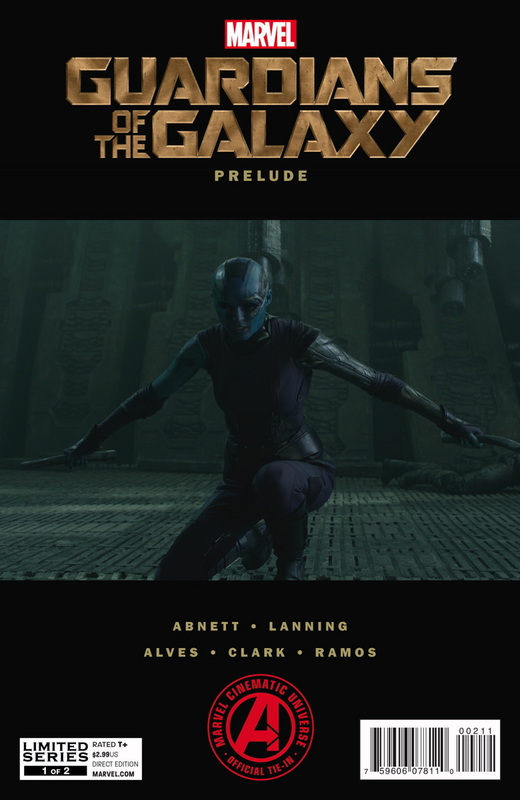 Told from Nebula's point of view (she's the bald woman on the cover played by Doctor Who's Karen Gillan, who actually shaved her head for the part), it tells how Thanos has trained Nebula and Nebula's frenemy Gamora (played by Star Trek's Zoe Saldana) to be ruthless soldiers or assassins or something along those lines. Yes. You read that correctly. Thanos makes an appearance in this comic. He does and says more in the pages of this book that he does and says on screen. The plot doesn't matter too much. It's about the relationship between the three, and it reveals a lot. There are flashbacks, each with their own twists, and there's a big twist at the end. And it is a bit confusing, because while it explores the trio's relationship, it doesn't explain everything completely. It is a decent stand alone story, and I give it a lot of credit for that. This might be my favorite tie-in comic yet. But add to that, this expands the MCU by showing things we have never seen before and introducing us to characters we have never met before, or have only seen in a post-credit sequence. Thanos is in the book. And I was surprised. Considering the mystery that was built up around the character, it was a surprise to see him just there! Talking. Doing stuff. And you know what? Now I have more questions about him! I'm going to say this is worth your time. If you are interested in the upcoming Guardians of the Galaxy movie, in this book you will be introduced to a couple things before you see the movie, and you are getting a decent sci-fi action story story with good art and some interesting thematic elements along the way. Oh, and next issue? Groot and Rocket Raccoon!!! It's written by Dan Abnett and Andy Lanning, with art by Wellington Alves and Manny Clark. 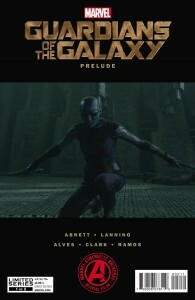 Get Guardians of the Galaxy Prelude at MyComicShop.com! Sounds right up my street. Thanks Ben I’m downloading from ComiXology right now. I honestly thought this was pretty decent. I picked it up on your recommendation and the fact that it was only $3. It became my first MCU comic purchase because you know how I feel!